In our previous eBook, “Part 1: Enabling Financial Transformation through Technology,” we examined the “why” of Record to Report transformation and briefly described ‘how” you can achieve this through the implementation of Record to Report technology. 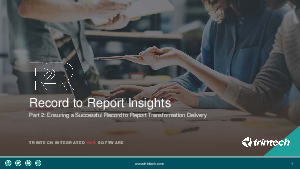 Now that you understand the “why” and the “how” it’s time to put it into action to ensure a successful Record to Report transformation delivery. But first we need to lay the framework, as the majority of you have probably never embarked on a financial transformation journey before or have experience with a technology purchase or implementation of this calibre.